Libremail softwares can be used freely and without anything to pay. Translation carried out by a software. Please excuse its defects. If you can not move until the end of the text below, click here. "La liberté n'est pas une marchandise" (Freedom is not goods). For a user or more a of free software developer or a developer of other products provided with a free use licence, it is an obviousness. For some other people, the most important is to sell, even if for that they usurp the name of a product already used by other people. It is unfortunately a current practice on the Web, and it happened with the name Libremail. From 2005, the creator of a commercial antispam propagated the idea on the Web and in data processing magazines, that people had to be paid him a monthly royalty to use Libremail. That involved a confusion with the filtering tools against undesired emails availlable for free on this website. Worse, while thus acting, the creator of this antispam propagated the (wrong) idea the only product called Libremail belonged to him, whereas the free software Libremail suite was diffused on the Web and was referred by the search engines for 2 years! He however changed the name of his product whereas a lawsuit was about to be committed. In order to defend, but also more simply to make known the name Libremail and the concept of freedom which is associated for him, support tee-shirts of had been created at this time and most of them are still available. Let think to specify the size, and the printed side you want. Payment by cheque joint for France, money order for the other countries. 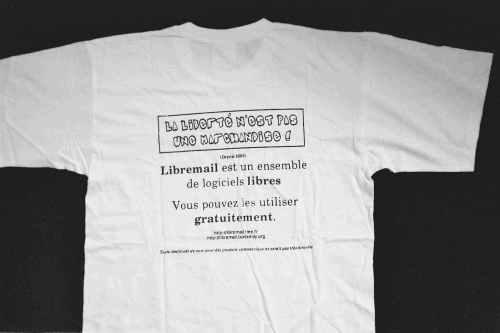 Of course, you are free to use the software Libremail even if you do not buy the tee-shirt. In the same way, you are free to buy and wear the tee-shirt of Libremail, even if you do not use the corresponding software. Each one has the right to choose.